Boulder County, CO: Today, Save The Colorado notified the U.S. Army Corps of Engineers and the Federal Energy Regulatory Commission (FERC) that Denver Water has continued to ignore its own data and instead provide spurious projections to those federal agencies in conjunction with Denver Water’s application to spend $400 million of ratepayers’ money to greatly expand Gross Dam and Reservoir in Boulder County. Save The Colorado commissioned an independent review of Denver Water’s actual water use and compared that with Denver Water’s water need projections, a step that could have — and should have — been done by the agencies during their review of the proposed boondoogle. 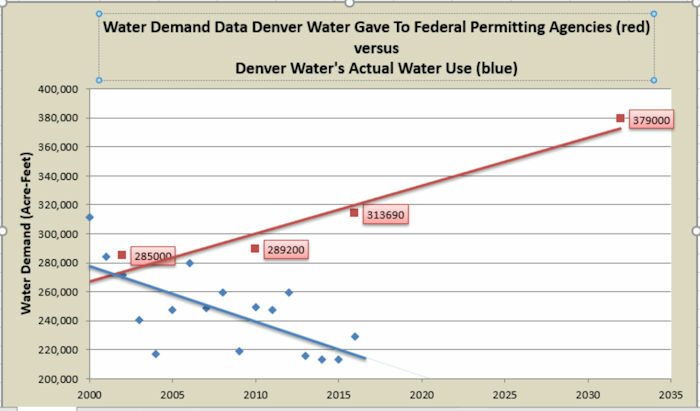 The analysis depicts a dramatic difference between the amount of water that Denver Water claims it needs — which Denver Water provided to federal agencies as a part of the permitting process for the massive expansion of Gross Dam and Reservoir — and the amount of water that Denver Water actually has used between 2000 and 2016. 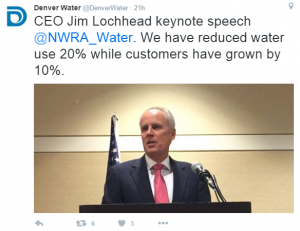 The analysis was done by LRB Hydrology & Analytics LLC, a consulting firm in Boulder, CO. The full report is posted here. Save The Colorado inserted the technical document, along with other documents, into the public comment period, which ended today, for the “Supplemental Environmental Analysis” for the FERC license process . FERC is expected to make a decision on Denver Water’s application in the next few months. Denver’s population is increasing, but its water use is going down — this is because Denver residents are actively conserving water and changing their habits. Importantly, in the Boulder Daily Camera on March 31, 2018, Denver Water also made the claim that the Army Corps had “independently verified the purpose and need and found the updated projections to be reasonable” (our underline). The Army Corps, in fact, had done no such thing, and instead contracted with the consultants with close ties to those who worked for Denver Water in the development of its “Integrated Resource Plan” in 2002 that declared the need for the Gross expansion. Save The Colorado raised this issue with the lack of truly independent review in comments presented to the Army Corps in 2015. Fish Face Extinction Due To “Historic Agreement On The Colorado River”?